Once an obscure technology, thermography has matured to enjoy worldwide use for a broad range of applications. 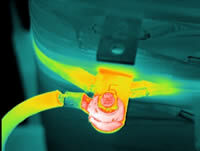 Thermography is now used routinely for PPM, PdM and Condition Monitoring for electrical and mechanical systems, buildings and roofs, boilers and steam systems, and process equipment. This course discusses the benefits of thermography, current applications, and how to initiate and maintain an infrared inspection program. This material is intended for anyone wishing to understand the application, uses, and benefits of infrared thermography. Course is designed for in-house and contract thermographers as well as PPM and PDM professionals.